How Curofy, an idea of 3 IITians is changing the health sector in India? Curofy is an idea of 3 IITians that is changing the healthcare industry in India. Curofy is a medical networking app enabling doctors to establish communication with other doctors. With Curofy, doctors can easily find other doctors, call them with a single tap, and connect to collaborate on patient cases. Why we chose Curofy as Startup of the Week? • More than 15000 verified doctors are using this private platform. • The mobile app keeps doctors up-to-date with latest medical news and developments daily. • It has options for seeking and offering second opinions on live patient cases. • It offers a separate section to get the best medical jobs and apply with the Curofy profile. • Search and connect with your old friends, colleagues and specialists. • The company has partnered with top hospitals in Delhi NCR naming Saket City Hospital, Medanta, Cygnus Medicare, and Ryerson Futures. • Share case information & specifics with relevant Doctors in Curofy network. • Strong presence over social media platform like Facebook in very short period. • Facebook Fan page has over 15K fans and Twitter has around 1800 followers. It was an evening of 2012 when three students at IIT Delhi were discussing about their future scope. 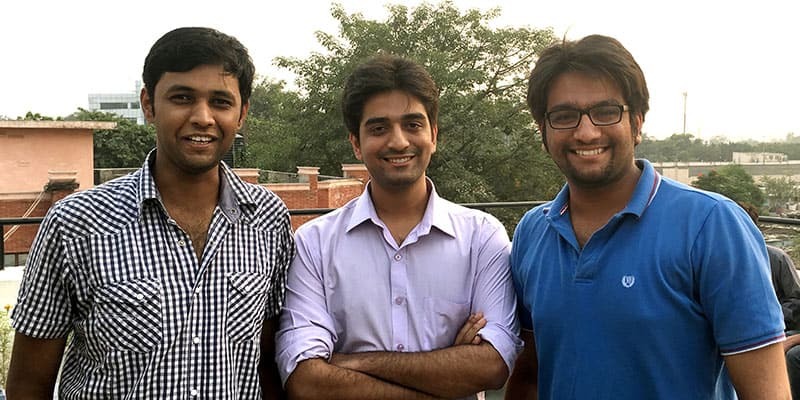 These three students were none other than the founders of Curofy. Pawan and Mudit knew each other before coming to college while Nipun came in contact during their study at the college. They all were inspired by the startup culture of India and they had already set their mind for that. Pawan and Nipun were in their final year of the graduation while Mudit still had a year to go with his dual degree course. During college time, the trio worked upon their own project of testing waters by starting a medical tourism company. Although the project was well enough, they felt insecurity with their future working as full time there. Mudit continued to work on the same project while studying; the other two went on to work with MNCs. Two years passed but the spirit of entrepreneurship didn’t halt. The healthcare industry kept on fascinating them and their research remained continue. Moving ahead, last year in May, they left their jobs and started with Curofy. Curofy started as a website first and then the team ran an alpha phase after which they realized that mobile-only was the way to go. They reached out to 1000 doctors and took in their feedback for this alpha which eventually resulted in the app. Now a mobile-only company, Curofy launched on the play store in February 2015. “We have more than 15,000 doctors on our portal from over 70 cities and from reputed hospitals like Medanta, Apollo and Max,” says Nipun. Publicity has been completely via word of mouth and organically growing through the set of doctors they interacted with during their research. The company with its fabulous idea to connect doctor with doctors had been able to grab the attention of the investors resulting in an early round of funding. It was at a reality event called TiE the Knot at TiEcon 2014, when the company got its initial funding. The startup also secured angel funding of roughly $160,000 from India Quotient, Spice Labs and a bunch of angel investors. Most recently the networking app Curofy raised fresh funds in its pre-series A round from US-based Roundglass Partners whose exact value is not disclosed but according to some sources it might be around INR 10-12 crore. Currently the company is facing the challenge of driving traffic from Whatsapp to their Curofy app. The app presents an interesting proposition as most other technology startups focus on doctor-patient relationship or patient tracking for medicines and reminders. Practo leads the way in leveraging technology when it comes to healthcare space.